The problem with Evelyn de Morgan is that it is really hard to write a short piece about her. 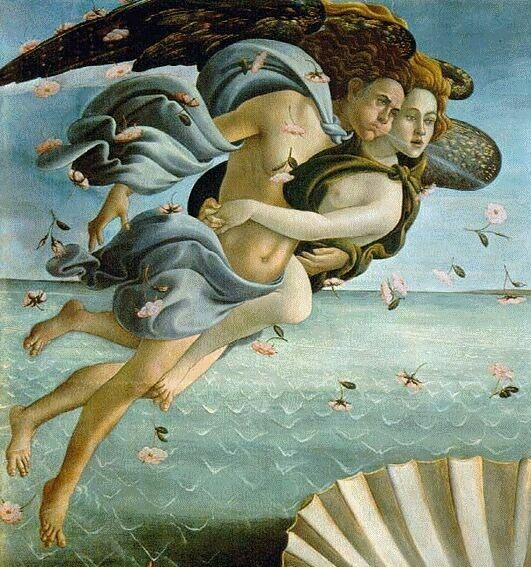 However ‘small-time’ and ‘B List’ she seems in the Pre-Raphaelite world, just writing a quick piece about her and her work is damn near impossible because when you start looking at her work, there is a whole can of worms that gets opened, both to do with the art and to do with the way it was and is received. See, this is my problem, there is just too much to say about her and way too much digression on my part to say it properly. 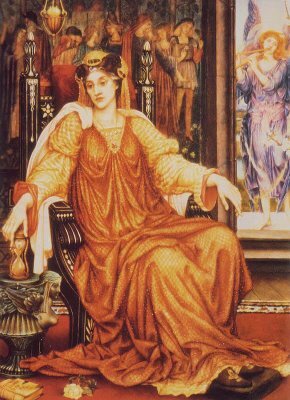 The thing about de Morgan is that she was amazing, and in a proper Pre-Raphaelite way. She and her husband developed a different way of using paint, mixing it with glycerine to produce clarity of colour which is amazing. That reminds me of how the early Pre-Raphs started painting on white to accentuate colour, getting the effect you want through manipulating your medium. When you see a de Morgan in real life they are luminous, they call to you from the other side of an art gallery with a joyous explosion of colour that is only matched by possibly Holman Hunt’s acid-luminous canvases. 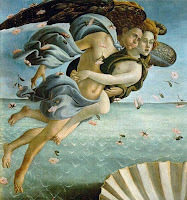 In order to explain the perfection and problem with Evelyn de Morgan we will look at some yummy pictures, starting with…. On the face of it, there are similarities. The way she did drapery is equally as exquisite as Burne-Jones and there are scores of beautiful sketches as she perfected the way cloth hung on figures. The pallor of the flesh and the classical posing also is shared by both artists as is some of the subject matter, allegorical scenes and legends, but the same could be said of G F Watts who tackled the same subjects, just in a different style. 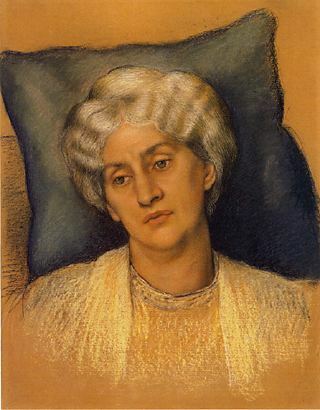 While on the face of it the above pictures have a resemblance, knowing Burne-Jones like some of you no doubt do there is no way you would think ‘Dawn’ was one of his, despite the signature. 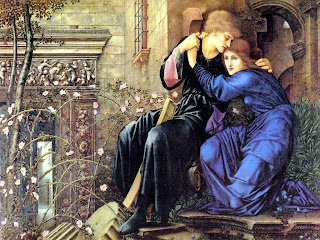 The colour palate is entirely wrong, Burne-Jones utilising a dreamy sigh of colour that makes his work unmistakable. I show ‘Love Among the Ruins’ above as it seems the most ‘colourful’ of his works (again, the illustration doesn’t do it justice) and the nearest I can get to de Morgan’s work. I suppose it’s easy for me to shake my head in wonder now, as I have books on Burne-Jones’ work and have seen exhibitions of his work, so have an overview of his style that enables me to go ‘Well, that obviously isn’t one of his’ when I see ‘Dawn’, but when the Russell-Cotes family bought it in 1922, they bought it as a Burne-Jones, assisted by a very kind signature that someone had added for them, so you can hardly mock them for their mistake. If you don’t have the luxury of seeing the entire breadth of an artist’s work, via the magic of modern reproduction, then it’s easy to make seemingly quite fair assumptions on the very little information you have. 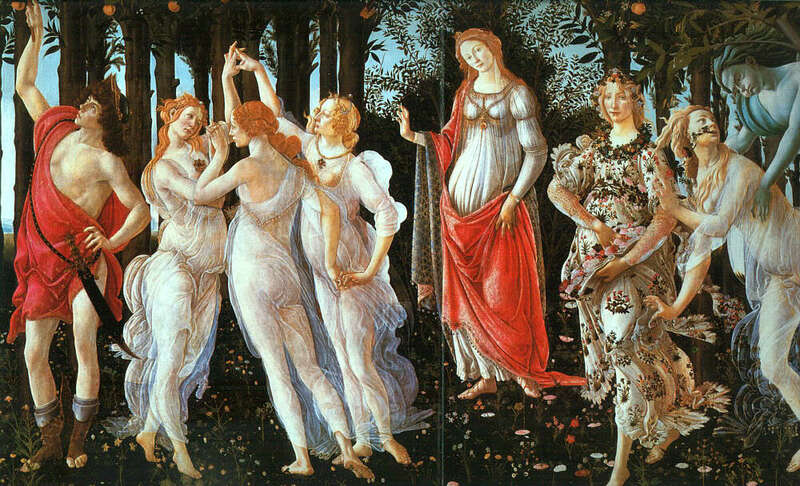 Couple the sprigged dress, floral carpet and classical, graceful pose and these ladies are sisters, and despite the differences in style, I find de Morgan’s art has a hell of a lot in common with Botticelli’s works. 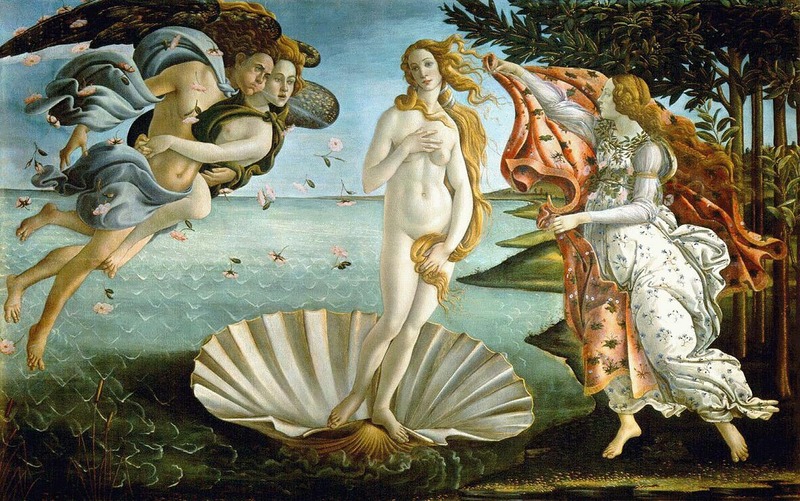 Almost thirty years since she had appeared in a picture, we have the Stunner out of retirement in an amazing painting which is primarily about the ending of life, but also, I think, about the brevity of ‘beauty’ and the way women obsess about their looks. 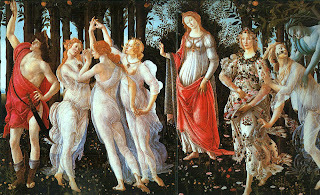 By choosing a woman whose young face was the icon of beauty for a movement, her older face is seen considering a rapidly streaming hourglass and a dying rose, while behind her, through the open door, the figure of Life pipes happily in the sunshine. The book on the floor entitled ‘Mors Janua Vitae’ or Death is the Portal of Life seems to imply that the very nature of our tumbling grains of life should push us to embrace more before it ends, not spend our time considering the grains that have fallen and will never be again. It is a bit of a female preoccupation that as we grow older and ‘by definition’ less attractive (if you believe all the adverts attempting to sell you stuff to make you young again), it is seen as inappropriate to frolick in the manner of our youth (my back isn’t up to a lot of frolicking at present, but I’ll try a little light cavorting), but this work seems to say that we are fools to imagine all we have left is to watch our time run out in a dark room. Turn yourself round and get outside in the sunshine, there is a whole lot of frolicking left to do before your sand runs out, you may just need a couple of Nurofen occasionally to keep going. 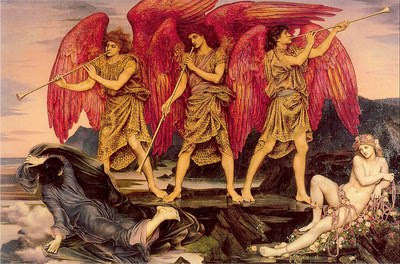 So to conclude this rather rambling love note to Evelyn de Morgan, I would like to see more of her work, an entire exhibition would be rather splendid, just to wallow in the luminous beauty of the paintings and the perfection of her sketches. 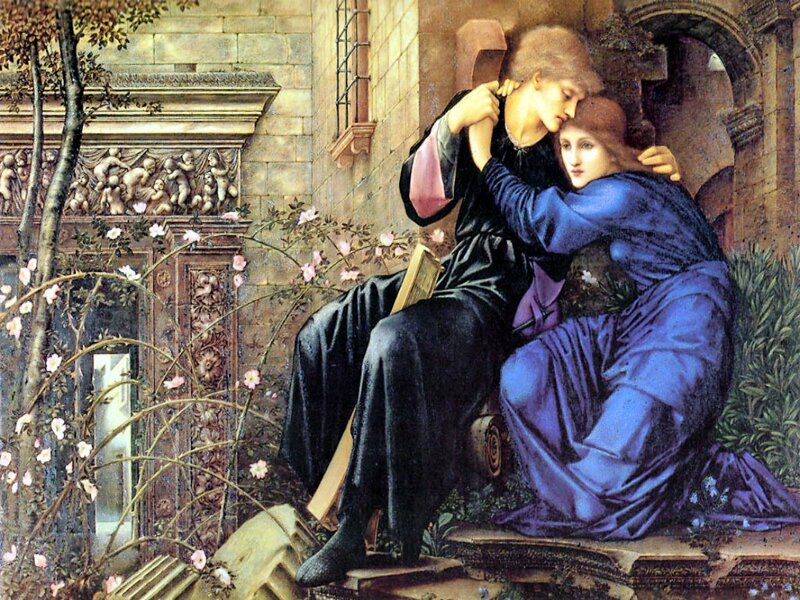 Just as Waterhouse’s work is akin to Millais’, then, yes, it is a fair comparison to show de Morgan’s work with Burne-Jones, but once together it is easy to see how different they are and how de Morgan’s work is worth celebrating as a powerhouse of late Pre-Raphaelite glory. Great, great post. But I was just posting about the 'split' (subtle in some cases) between the prb's who followed Ruskin and truth in nature and those who followd a 'medieval' path. 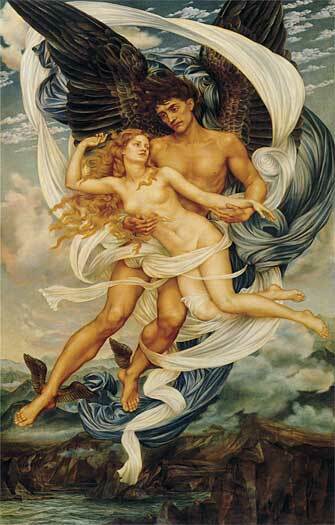 De Morgan, like BJ, was of the later and headed into the Symbolist camp. Great work though. What a team (in the nicest sense of that word) she and her husband were. And don't forget one of my favourites Kate Bunce - undervalued I think. Oh, I love Bunce, but my favourite has to be Eleanor Fortescue Brickdale because it's just so beautiful. I'm rather keen on Louise Jopling too. SO many great artists, so little time ! Fascinante Evelyn, y las otras. Todas tienen gran mérito y belleza. Thanks, Kirsty, for devoting a thoughtful essay to Evelyn. We who know and love her feel she is too often passed off as a second rate EBJ. She is far more akin to Watts in spirit if not in style, as you say. Many of her works find direct correspondence with her automatic writings which lend another level of depth to her allegories. My research partner, Dr. Nic Peeters and I (Nic FAR more than I) have been collecting research on Evelyn and Italy and one of these years we hope to publish it. Thanks again for giving a well-deserved shout out to EDM!